In the Knitting and Crochet Guild Collection, where I volunteer, usually a couple of days a week, we have just had a whole week of sorting out knitting needles and all the other tools and gadgets. Last year we did a whole week, monday – Friday, so that people can come from a distance and spend more than a day in the collection, working to sort out what’s there, seeing all the amazing things, discovering more of them, and most important of all, having a great time. There was a whole aisle in the warehouse with shelves stacked with knitting needles, (straight, circular, double pointed), crochet hooks, yarn holders and winders, row counters, and other goodies like needle boxes and Betty knitter gadgets. It took several of us all morning to bring it all out ready for sorting. This is a crate of knitting needles … there were several similar ones. There’s more about this on Barbara Knits Again where she writes about the yarn holders and shows some pics of really lovely ones. The best thing about the whole week was not just getting the needles and tools sorted, or a long way towards that, but having people come to help, some for the week and some for two or three days. We also had some special visitors in the shape of a founder member of the Guild, Kathleen Kinder. 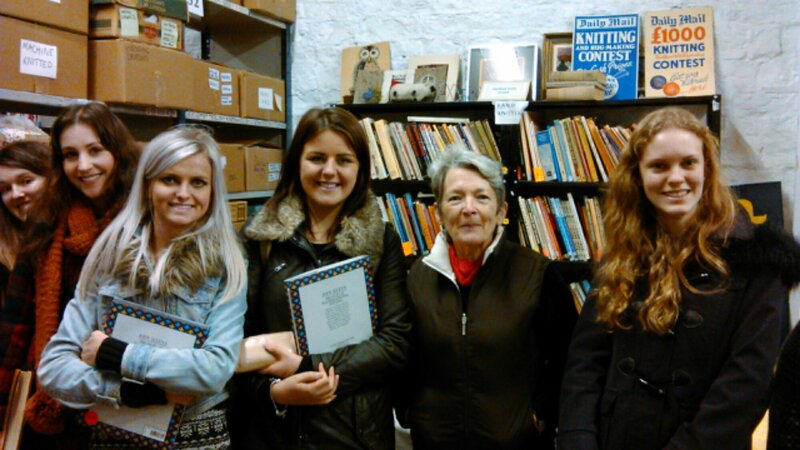 We had a visit from second year textiles students to see the collection. Here are some of them with me. Some are returning next week. 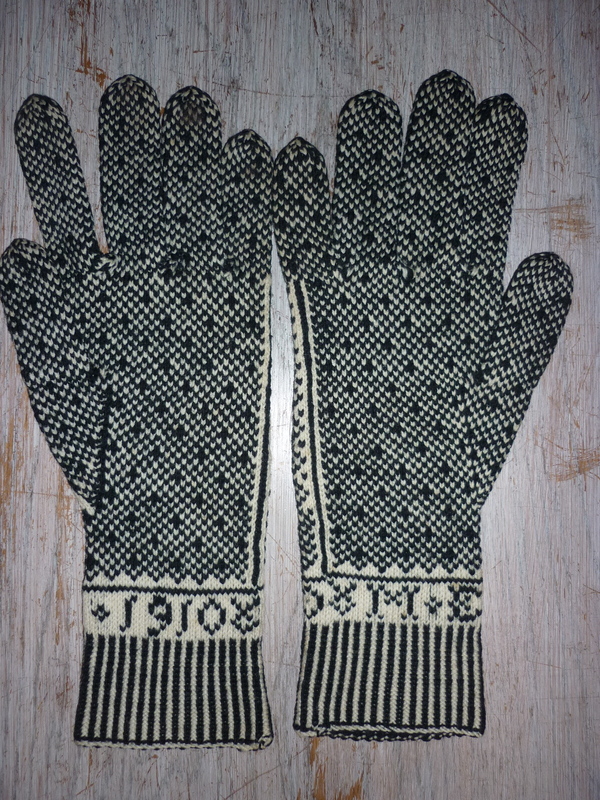 Well only the thumb to go before I’ve finished the Shepherd’s Plaid gloves. I should be able to do that tomorrow. Then on to the next pair. 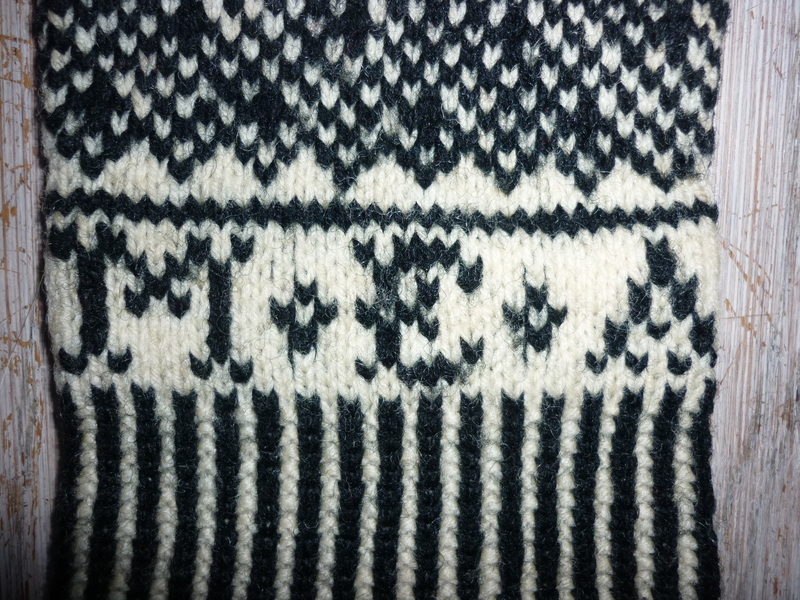 Charcoal and cream I think, in my own design, based on all the ones I’ve knitted already. 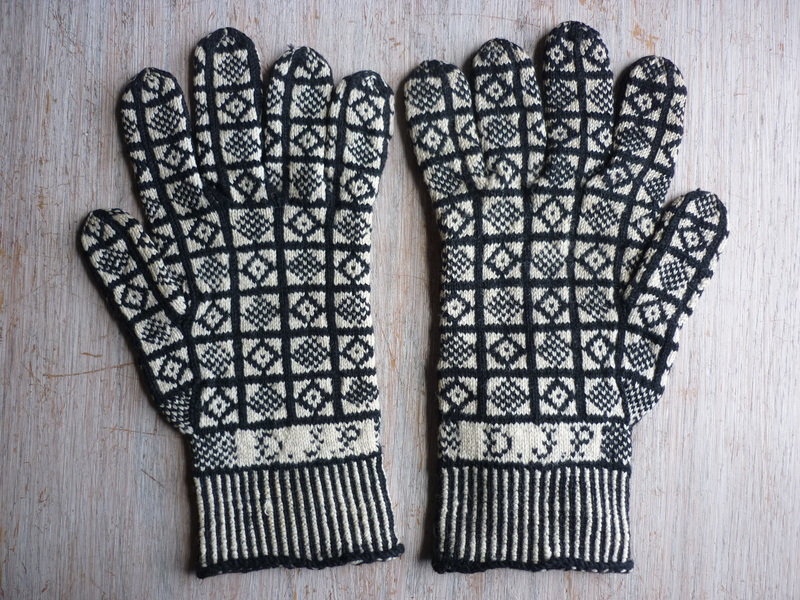 Anyway, the big news is the discovery of two more pairs of pattered British gloves in the Knitting and Crochet Guild collection. 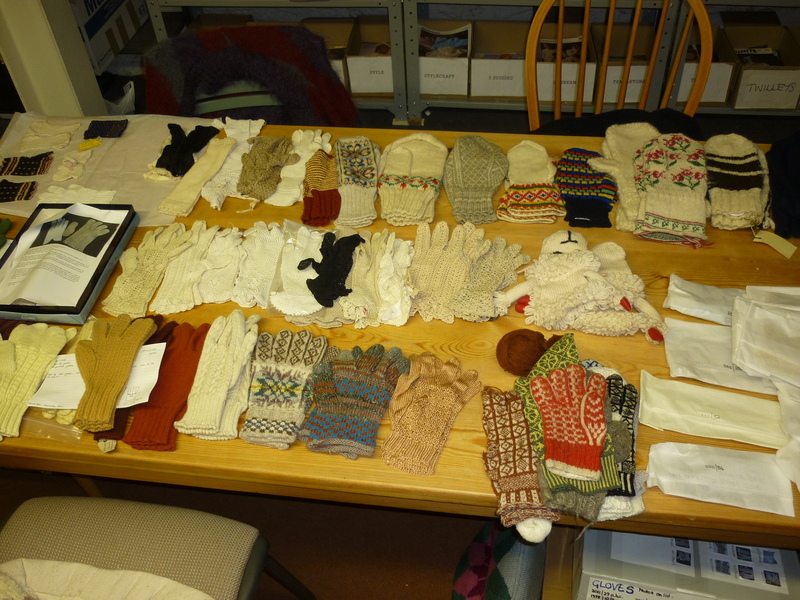 I was at Lee Mills on Friday helping to sort things out and had the box with all the gloves and mittens. 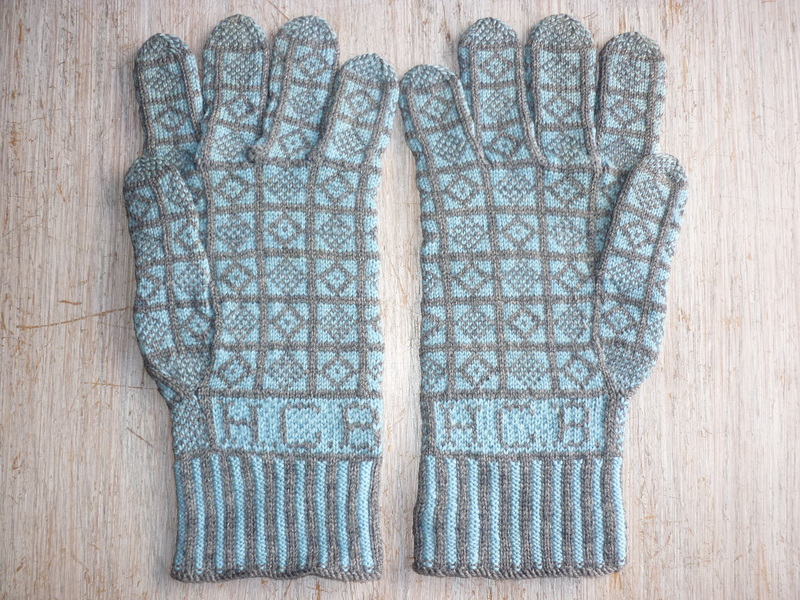 These are beautifully knitted and in good condition. 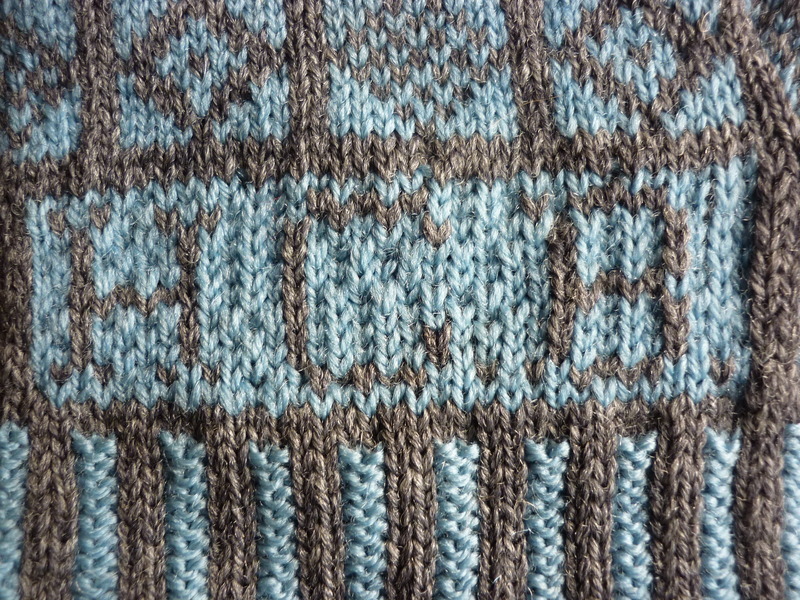 The initials are worked with the yarns woven in at the back creating a small surface texture on the front of the fabric and an exceptionally neat fabric on the inside. The colours are lovely, rather 1930s in feel although the gloves are more recent than that. 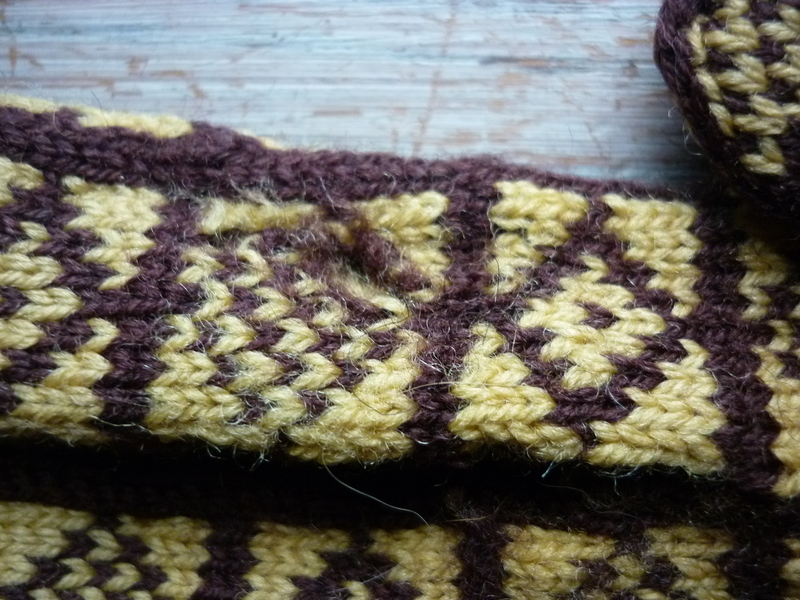 These are also well knitted but have signs of wear on the cuffs. 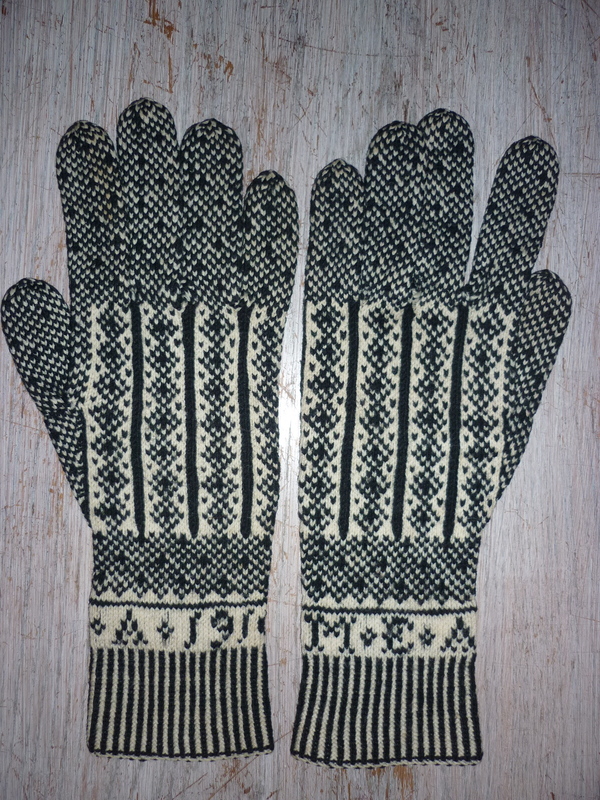 The single rib is more usually found on the ‘Yorkshire’ gloves and the cast on edge is tending to curl out. Still, they are a good example of the kind and in very typical colours. 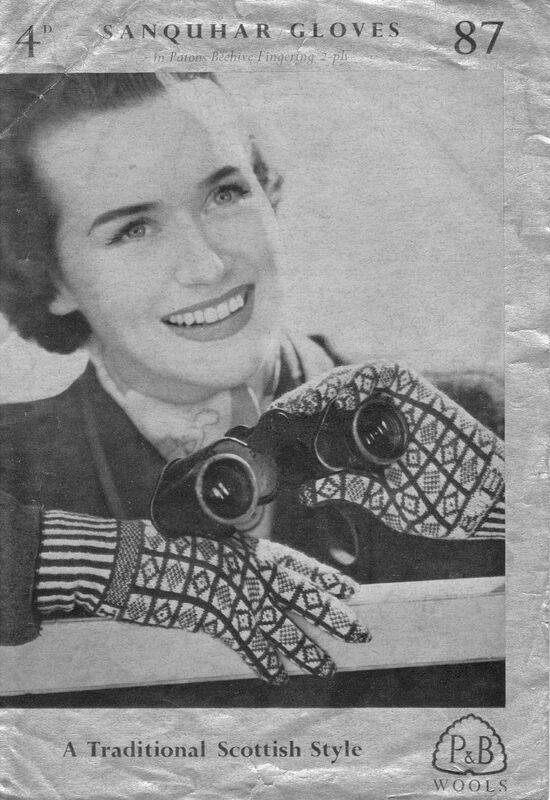 Another find in the Knitting and Crochet Guild collection! 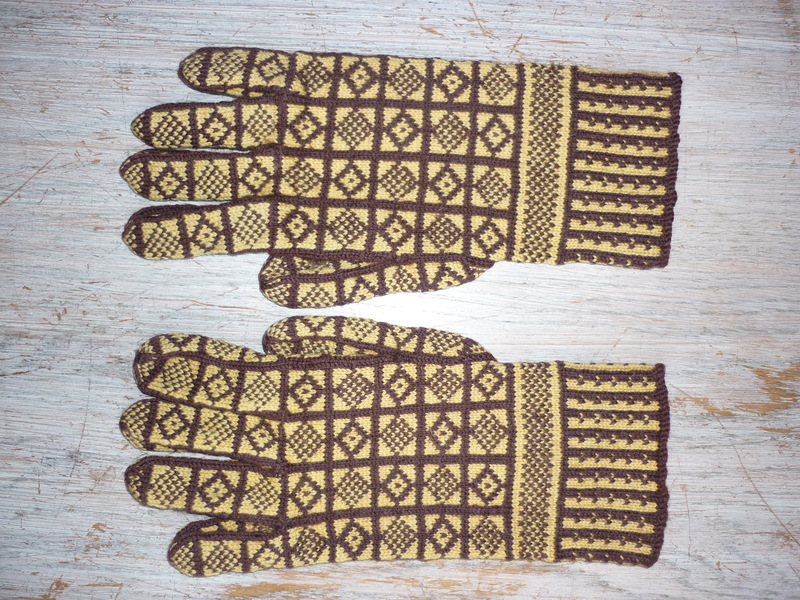 I was working at Lee Mills today, helping clear the last of the boxes of garments in the collection and this almost pristine pair of Sanquhar gloves turned up! 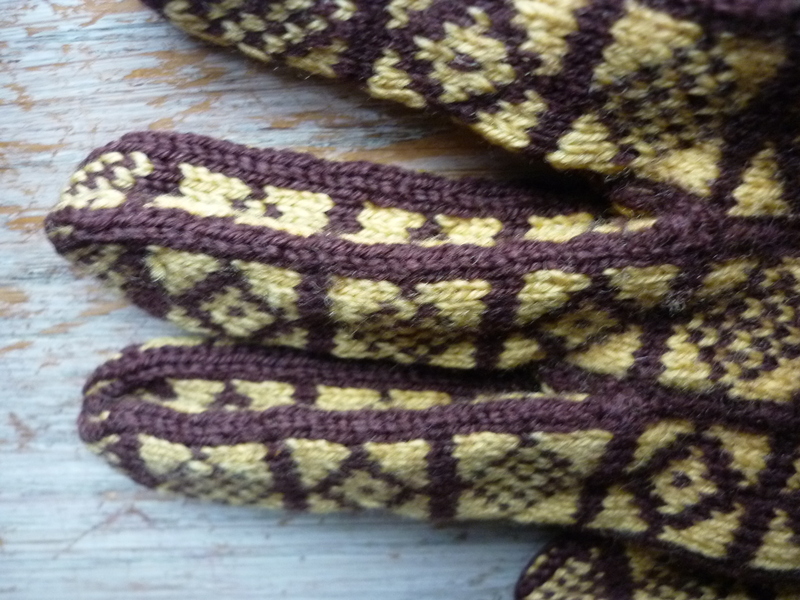 These are very nicely knitted in brown and mustardy colour wool, so finely spun that it appears quite flat to the naked eye. 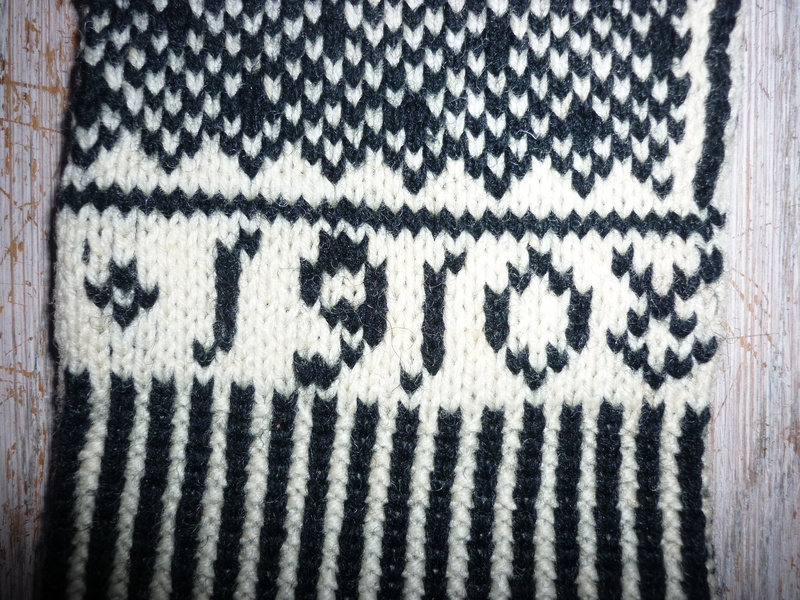 They are in the most usual of the Sanquhar patterns, the Duke with initials in the cuff, U.W. There is no date knitted in and no record has been found for them yet, although one might turn up as the collection gets more sorted. 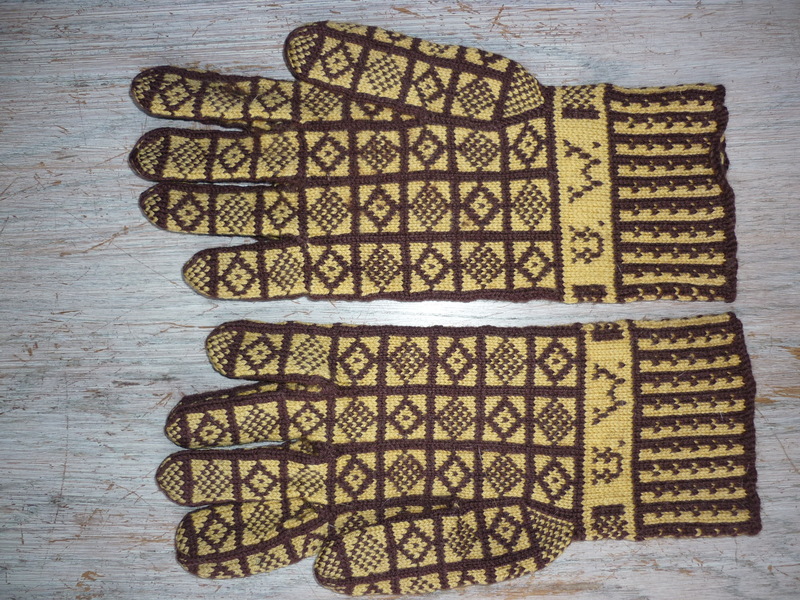 The interesting thing about these gloves is that they are one square pattern smaller round the hand than the other pair I own and those that I am knitting from the SWRI pattern. 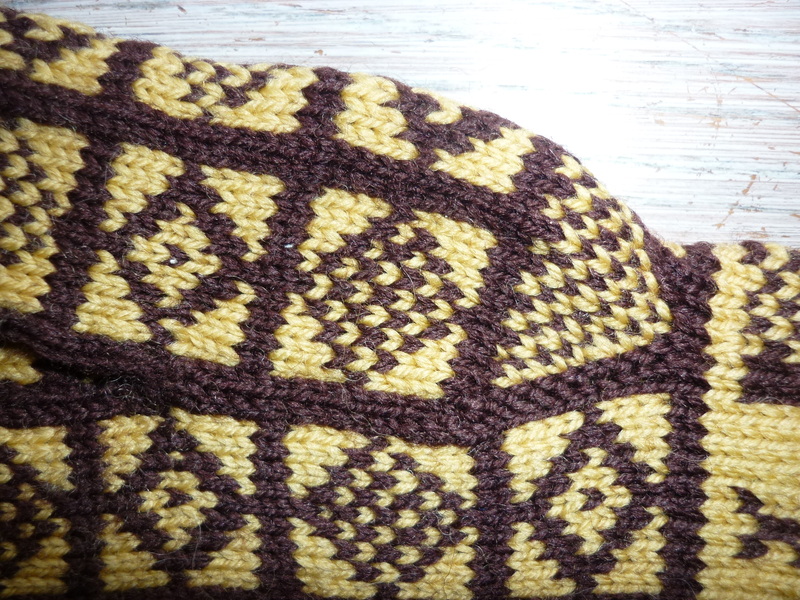 this enables the fingers to be folded flat as the pattern falls slightly differently in relation to the hand. The only damage on them is a small hole in the first finger. It could almost be a cigarette burn or perhaps a moth hole. It is a pity about this as otherwise they are in good condition, clean with little evidence of wear. The palms showing date, 1910 and initials, MEA. They are in good condition with no holes or signs of wear. They appear to be identical to those I’ve seen in other collections at Gawthorpe Hall, the Dales Museum and the Wordsworth Museum.